finally. a new layout to share. it's been a while since i scrapped anything, layout wise. this one went up on the bella blvd blog today. i knew i had a layout to get done for this week, and wasn't really sure what i wanted to do it on. since i'm the one that writes the bella blog, and sees all the assignments coming in, i've loved seeing all the great christmas layouts from the design team. i'm sure i've mentioned this before, but i'm just not a huge christmas scrapper. no idea why not, since i have lots of photos from every christmas. maybe it's the daunting task of narrowing down all those photos and working them onto a layout. but i decided to go for it, and i knew i would start with a good photo collage. i've gotten away from my photo collages that i love and used to use ALL the time. i miss them. 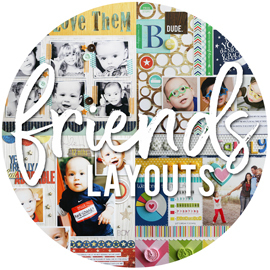 so this layout started with a collage of 16 photos from our 2010 christmas get together with my side of the family. i printed this out at 7.5 x 7.5 inches, and rounded the corners. i started with pieces from the christmas wishes collection. i knew i wanted to use the red chipboard "christmas" alphas, which would add a nice amount of red to the layout. next, i went looking for greens and browns. i ended up pulling the brown woodgrain paper from the tail waggers and cat naps collection, because i loved the way the collage looked against it. once i had my main colors of red, green, and brown, i added in some touches of aqua and yellow, using the stickers and chipboard border piece. it was a very last minute decision to add this little chipboard reindeer. i had this empty space, and figured i would add the date or a few more stickers. but the reindeer was so cute in the package, and he fit nicely there, so i added him. 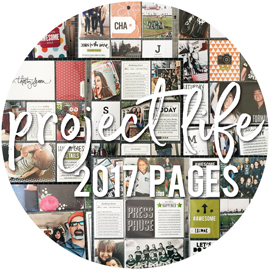 this journaling could go with just about any christmas get together with my family. and i love that. we have our traditions, and our way of doing things, and i love doing those things every year. and a quick photo of us from this christmas. it was a busy holiday weekend, with three family get togethers in three days. we were all so tired yesterday, and spend the majority of the day trying to recover from all the hustle and bustle of the festivities. My Mind's Eye is having a Holiday Hoopla Blog Hop, and I'm excited to be playing along for it! We are going to send you on a scavenger hunt to collect all the parts of a secret phrase, and to get yourself entered for a chance to win one of two great giveaways. It's very important that you start at the My Mind’s Eye blog, and “hop” on over to every blog you are sent to (be sure to hop in order). You can also find out all the details for what you need to do and what you need to collect, on the My Mind’s Eye blog. So definately go and hop over there, if you're just landing on my blog! We were all asked to share our favorite My Mind's Eye layout, and this one immediately came to mind. I created this as part of my guest designer feature, back in October. You can read more about it HERE. 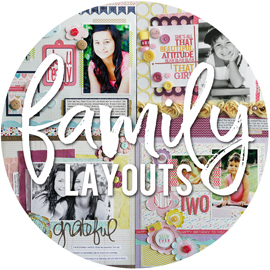 It's a favorite of mine, because it's a layout about our family. And because it has all my favorite products and colors. And it's just such a "ME" layout, that shows my style. 1) Grand prize: After visiting every blog, email Amber the secret phrase. One winner will receive the 12 Days of Christmas collection and both Kraft Funday collections! 2) Bonus entry: We will randomly draw one of our designer’s blogs and draw one winner from the comments on that designer’s blog. This winner will receive the entire 12 Days of Christmas collection! You will have through Wednesday, December 28, 2011 to hop. Are you ready for your next stop? You will want to head on over to Suzanne Sergi's blog! christmas is in just four days, and i'm not even close to being ready. my tree was set up, without lights, for a full week. then i added the lights and garland, and it sat for another week. then i added half the ornaments, and it sat for another week. and just a few days ago, i finally added the other half of the ornaments. the only other spots i usually decorate in the house, are the mantle above the fireplace, and the entry table by the front door. those are both decorated nicely, with lighted greenery and christmas decor and accents. and yet yesterday, one of the daycare girlies asked me "why didn't you decorate for christmas?". lol! oh, and btw, i haven't wrapped a single gift yet, so there are NO presents under the tree yet. this year, it just seems that we haven't had time for so many of the things that i wish we could do. work, school, soccer, band concerts. it's just been really busy and hectic. since i haven't done a single crafty things in ages, i figure i would use my love for pinterest to show you some of the things i have "pinned" on my boards, that i would like to make. if i had time. love the pom pom garland. i have a basket of yarn covered styrofoam balls in my family room already, in these same colors, that i keep out year round. need to make one of these for my mantle. info and tutorial HERE. and i have to have the pom pom ornaments to match. into and tutorial HERE. these star ornaments are perfectly simple. love them. info and tutorial HERE. i love this tree skirt! would match my home decor so much better than the tree skirt i've been using for the last 8 years. info and tutorial HERE. these stockings would match the tree skirt perfectly. from etsy, but no links, and could be easily made. i think. i have a thing for covered styrofoam trees. love these, but i'd choose a different color to match my decor. instructions HERE. super cute felt trees. love these. info and tutorial HERE. love this paper tree too. so simple, and love the sheet music paper. info and tutorial HERE. these tissue paper covered trees are adorable and fluffy! i'd do different colors, to match my decor. info and tutorial HERE. if i had a big chalkboard wall, i would love to do this for a unique advent calendar. love the simple brown bags. info found HERE. i kind of wish my mantle looked like this. love the painted pallet, and the rustic stockings. info found HERE. welcome to a very special surprise "happy birthday" blog hop, for bella blvd's one and only, stephanie hunt! for those of you that don't know, stephanie is the owner, designer ... well, she's the "everything" of bella blvd. when i found out she was having a birthday this month, i knew i had to get the design team together to do something special for her. she is so generous with all of us, and we wanted to do something for her on her special day. so we put together this surprise "happy birthday" blog hop for her! if you're just finding our blog hop, you will definitely want to go back and start at the beginning HERE, on the bella blog. 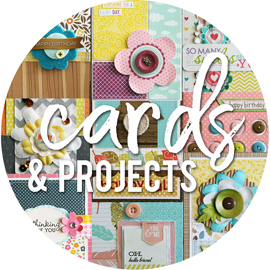 we have TWENTY SIX of our design team girls participating, along with three girls that are sharing their cards on the bella blog, and you won't want to miss a single card! happy birthday stephanie! i hope you have an amazing birthday, filled with all sorts of goodness, family and friends, and definitely some cake and ice cream! you're one of the hardest working women i know, and i really hope you get a chance to relax, take it easy, and just truly enjoy your day. for my card, i choose to use the hello beautiful collection. i love this red text paper, and really wanted to use it. i added the floral paper to the top of the card, and went looking for some ribbon to add between the two patterned papers. i found this wide green and white striped ribbon, and decided it was perfect. i wanted to pleat the ribbon up a bit, to add lots of texture to the card. when i do the pleating with my ribbons, i like to add brads to each pleat, since it really secures the ribbon down. i pulled out my itop tool, so that i could create my own brads, using this yellow patterned paper from the spring flings and easter things collection. love the dimension those brads add to the card. 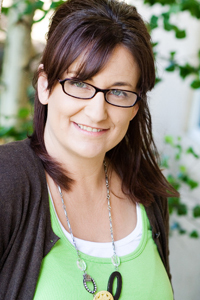 your next stop on the blog hop, is wendy wagner. even though it's stephanie's birthday, we have some gifts for a few of you lucky readers as well! we know how generous and giving stephanie is, and we know she would never have a fun blog hop, without a few giveaways up for grabs too. so we got permission from robin, who works alongside stephanie in the office, to pick TEN lucky winners, who will each receive a bella blvd collection. all you need to do to be entered in the random drawings, is to leave stephanie your birthday wishes in the comment section. you have lots of opportunities to up your chances, since you can leave a comment on each blog you visit, as you go through the blog hop. there are 26 blogs, plus the bella blvd blog, for a total of 27 chances to get your name in the pot. we will randomly choose winners, from 10 randomly choosen blogs, and announce them on friday! back when i was guest designing for my mind's eye, in october, i was also asked if i wanted to contribute a project to their december "holiday hoopla" on their blog. of course i would! they sent me over the 12 days of christmas collection, and here's what i came up with for my project. i'm really not a "project girl". meaning, i would much rather stick to layouts and cards. but one altered project that i have created a lot are these covered paper mache boxes. i picked up a few different sizes and shapes at the craft store and went about covering them up with fun patterned paper. before i started, i picked out a few chipboard accents that would work nicely with each box. this long box was perfect for the "merry & bright" banner piece. once i picked those out, i was able to choose my papers to match. i kind of want to roll up socks and put them in this long, narrow box. it's the first thing that came to mind. and it wouldn't be weird, since the girls usually get some warm, fuzzy socks every christmas. before i adhered the papers, i painted all the edges of the boxes, with white acrylic paint. i knew the papers would cover the majority of the boxes and lids, but i didn't want to fully wrap them around all the edges. by simply painting the outside edges of all the pieces, it gives a very finished look. don't ask me what i'll put in here. if i knew, that would mean that i would have actually done some of my christmas shopping already. which i really havn't. i used mod podge to adhere the papers to the boxes and lids. one coat of mod podge to adhere the papers on, and another coat of mod podge directly over the papers to give it a nice shiny look. it also helps seal the papers on better, so they can stand up to more wear and tear, and not risk the papers starting to peel off. you can see my projects on the my mind's eye blog today. and they're also doing a giveaway on that post, where one lucky winner will receive the 12 days of christmas collection. so head over and leave a comment, for a chance to win! i wanted to share a few things going on over on the bella blvd blog this week. first up, our december issue of the bella buzz newsletter came out today! i spend a lot of time for each issue, choosing designers to feature, and searching for great layouts in online galleries and on bella's facebook page to highlight as well. it's always exciting to see it all come together, and we hope you all enjoy it. you can view and download the december 2012 issue HERE. we also have a new monthly project sheet available this week. 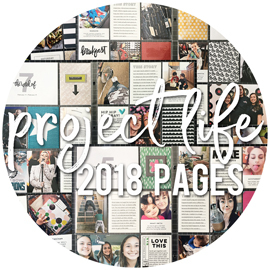 these are brand new layouts that i create each month, and we put them into project sheets, with full supply lists and step-by-step instructions. you can download the december project sheet, featuring bella's christmas wishes collection, HERE. sorry i went and disappeared on you for a few days. being sick is no fun at all. it knocked me out for two days, but i'm feeling so much better and trying to catch up. i even did a little scrapbooking! i had a layout scheduled on the bella blvd blog today. wednesday's are free-for-all days for our designers, where they can make any themed layout they want, using any collection they want. i love that even though it's the middle of december, i could create a fun, summertime layout. this photo of the girls is a long time favorite of mine. it's from 8 years ago, and i took it at my parents house. when the girls were little, joe and my brother (and even my mom and dad) would toss them super high in the air, while in the pool. it was a favorite activity, and i have SOOOOO many photos of them doing this. but THIS photo? well, this photo was the best one that i ever got. it makes me smile and giggle just looking at the expressions on the girls faces. and how hilarious is sarah, all sideways, with her pigtail braids flying about? love it! my parents have had this photo hanging on their fridge for probably about 8 years. and every time i'm over there, i comment on how i need to dig out my negative and have it reprinted. but i never do it. a few weeks ago, they were on vacation, and we were over visiting with jenny, their dog. and i was standing their looking at the photo, and then i just took it right off the fridge. took it home with me, scanned it into my computer, cleaned it up, and had it printed as an 8x12 enlargement. easy peasy. by the time i added it to my layout, it sort of looks like an 8x10. there was quite a bit of empty space on the bottom of the photo, so i just shorted it to make room for more pattern paper and color. because there was empty space on this photo, i was also able to add my title directly to the photo, using some alpha stickers. i dug through different bella collections, to find papers that matched well together. sure, using a collection is easy, since it all coordinates together. but i have fun pulling from all different collections, and i love the challenge of finding pieces that go together. i started by looking for pinks and aqua's, to go with the girls swimsuits. i added in the yellow, mainly because i wanted to use the yellow scalloped border sticker. i went looking for a ribbon to add next to the photo, and came across this colorful one from american crafts. it had my pink, aqua, and yellow in it. and then i just added some extra embellishments in browns and green, to match the other colors in the ribbon. these fun chipboard buttons are from some older bella blvd collections. i threaded a few of the buttons with some jute string, and added some silver mini brads to the centers of a few as well. i thought it would be funny to add this little disclaimer to the layout. i'm almost positive that the original photo had my brother in it as well. he's directly to the left of joe, when looking at the photo. but the photo on my parents fridge was an 8x10, which came from a 4x6, and then i enlarged to an 8x12. so maybe he got cut out, unintentionally. but one could think, just looking at the photo, that joe in fact threw BOTH the girls up, for this shot. not to say that he couldn't have tossed them both, because i'm sure he could have. but there was another set of hands involved. the girls saw this layout yesterday, and said i "dissed him". lol! i almost forgot that i had to announce a winner for the "last minute gifts" blog party giveaway. i randomly choose the winner really late last night (i stay up late, so it was actually today), but never got to blogging it this morning. congrats heather! email me, and i'll get your info over to kerri, to get your prize all arranged! 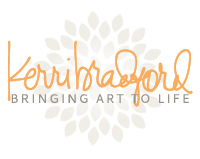 if you havn't been keeping up with the blog party, you will want to head over to kerri's blog and lori's blog, and see all the amazing projects they've been sharing all week. tonight, we are having our team pizza party for sarah's soccer team. since i'm the team mom, i had to come up with some thank you cards for our coach's. i decided to lift one of my own cards, since i loved the design. i made these 5x7, since i will have all the girls sign the inside. i needed the extra space for 14 girls to sign. i made 3 of these, since we have three coach's. i hope they don't pick up on the fact, that they all say "number one". lol! i figured i would share my other layout from the scrapbooking with fabric & notions special issue, from creating keepsakes. this is technically my last layout share from the 2011 CK issues. as seen in the Scrapbooking with Fabric & Notions Special Issue, from Creating Keepsakes magazine. copyright creative crafts group. posted with prior permission from the publisher. i was asked to use satin material on a layout. when i think of "satin", i think of something dressy or fancy looking. i was picturing cream or white satin fabric, and i'm so NOT a fan of cream. i headed to joann's, in search of satin, and was pleasantly surprised to find lots of gorgeous, bright colors to choose from. i had NO clue what photos i wanted to use for my layout, so i just choose some colors that stood out to me. i went with the aqua, green, and brown. so pretty! later, i remembered the girl's halloween photos from 2 years ago. both their costumes had a lot of aqua in them, and sarah's had a touch of brown. i figured the green could pick up the little bit of greenery in the background of the photos. when it comes to scrapping halloween photos, i'm not really about using your typical halloween colors. so i knew this would make a fun, colorful layout. i searched for quite a while to find some pattern paper for this layout. i didn't want anything too overpowering, and this trees paper from studio calico just kept calling me. no matter how many other papers i tried out, i kept coming back to it. so i just went with it. for my title, i used some chunky brown glittered chipboard letters from making memories, along with my favorite loopy alpha stickers from doodlebug. edited to add: i just noticed i have white loopy alpha stickers on my two page spread photo, and brown loopy alpha stickers on the other photos. i guess that gives away the one change i had to make to this layout, before it was sent to the magazine. lol! the white looked good in person, but the brown definately stands out more in photos and in print. i really should have re-photographed the entire spread. when it came time to use the satin, i knew i would keep it fairly simple. i have done some work with fabric before, but have never really used satin material before. it wasn't the easiest thing to work with. i did my best to cut fairly straight strips of each color, and then did zig zag stitches across the edges. i embraced the imperfection, and tried to make it fun looking. i also found that the satin fabric was tricky to adhere. i used glue dots on the bottom piece (the green). but since the brown was overlapping the green, it wasn't really adhereing. so i started the brown pieces again, and stitched them to some scrap strips of cardstock. it was much easier to adhere that way. i also machine stitched around my journaling tags, and tied some small strips of the satin fabric to the tops. i had the shiny satin fabric and the glittered chipboard letters. to add just one more little "bling" to my layout, i sprinkled on some of these colored sequins. i happen to have some in aqua and green, so i used mini glue dots to adhere them. I often make little cards, or envelopes, for giving out gift cards. I didn't set out to create this fun box, for holding a gift card. But it turned out, that the size I choose to cut my box in was quite a bit smaller than I realized, once I assembled the box. It turned out to be the perfect little size for a gift card. I used Lori's box with bracket flap (SVG's on Lori's site. shape also located in Lori's Silhouette store), and cut it from some red tone-on-tone pattern paper. I used a few snowflakes from Kerri's This & That Winter: Shapes Only kit, and adhered them to the front of the box using glitter brads. When I saw Lori's Photo Box (SVG's on Lori's site. shape also located in Lori's Silhouette store), I knew I wanted to create a few, for sharing photos with family over the holidays. I have family members that we only see a few times a year, and Christmas is always one of those times. I tend to save up photos of our family, and my girls, and hand them out when we see everyone. I think it'll be so much cooler to hand them out in such adorable little boxes. And the recipients can easily keep them in the box, until they're ready to find a home for them. I embellished the front of the box, with a loopy frame from Kerri's Life Additions #1 kit, and some pretty flowers from her Modern Nature kit. With several golfers in my family, golf balls are a very popular gift of choice around here at Christmas time. There are usually a few boxes under the Christmas tree, or tucked in stockings. Instead of leaving them in their original boxes, I thought it would be fun to create a more unique box to hold them in. I cut the "Play Hard" title from Kerri's The Ol' Ballgame kit, to add to my boxes. I love the grungy look to it. Love the amazing details, that cut perfectly on my Silhouette. Lori's Bracket Closure Box (SVG's on Lori's site. Also located in Lori's Silhouette store) was the perfect shape for it. When I adjusted the size of the box to fit the width of the golf balls, the box ended up being just long enough to hold four golf balls. And now for the giveaway part! Kerri and Lori have generously given me a $25 shopping spree to EITHER of their stores, to give away to one lucky blog reader. Just leave me a comment, telling me your favorite handmade gift that you love to make every year, for gift giving. I will announce a randomly drawn winner on Friday! christmas shopping. have you started yet? were you finished months ago? are you close to being done? i'm one of those that hasn't even thought about christmas shopping yet. i'm a total last-minute girl, and that goes for my christmas shopping just as much as it goes for everything else in my life. so the last minute gifts blog party is perfect for me! kerri bradford and lori whitlock are two of my absolute favorite designers, when it comes to my silhouette shapes. i'm pretty sure i have almost their entire collection, in my silhoutte library. so, when they decided to team up for this blog party, i thought it was brilliant. both of their design teams are playing along, and we used shapes from both kerri and lori for our projects. kerri is offering one freebie each day this week. "holly jolly" is the freebie for monday. you MUST go get it today, because each freebie is only good for one day. at the end of the week, all five freebies will go into a kit, that you can then purchase. but if you stay on it each day, you'll have them all for free! as seen in the Scrapbooking Holiday's and Celebrations Special Issue, from Creating Keepsakes magazine. copyright creative crafts group. posted with prior permission from the publisher. when i was asked to create a summer birthday layout, i was all over it. my birthday is in june, sarah's is in june, joe's is in july, and alyssa's is in september (which is still summer around here). and the majority of my family and joe's family all have summer birthday's as well. most of our parties end up being pool parties. so i dug around and found a birthday/party that i hadn't scrapped yet. what i came up with was sarah's 8th birthday. i knew i wanted a lot of photos on my layout. i always end up with tons of photos, and i do my best to get at least one photo of each guest. i don't think everyone ended up on this layout, but all of her closest friends did. i always try and include a few photos of the birthday girl opening gifts, and at least one photo with the cake. i printed 9 of my photos at 3x4's, and 3 of them at 3x3's. for my title, i used a favorite mix of alphas. chipboard alphas, which in this case, i used bella blvd. and my favorite alpha stickers by doodlebug. i'm not even going to admit how long i spend arranging these three stickers. i tried so many different configurations, as if it was a major life decision. lol! i choose pattern papers from the beach babe collection from fancy pants for my layout. the colors worked perfectly with all the girl's swimsuits. and i thought the fishies were so cute, because we have always said that sarah is truely a fish in disquise. that girl can swim the entire day, and never get tired. i thought the little "bikini brigade" border strip was really fun too. i printed my journaling on the backside of one of the pattern papers, that had a distressed solid yellow on it. it was easier then trying to find yellow cardstock that matched perfectly. to add a little "birthday" feel to the "summer" feel of the papers, i added some fun birthday stickers from making memories and carolee's creations. now that i finished sharing a summer layout, i really need to get on the christmas wagon here. lol! my pre-lit tree only has about half the lights working. and we don't have the patience once again to try and figure it out. so i'm stringing a few strands of lights on it, to fill in the gaps. which reminds me why i have a pre-lit tree to begin with. because i detest stringing lights ;) i need to get one more strand, and then maybe i can decorate it. it's been set up for 5 full days, and still doesn't have ornaments on it. hopefully, i can work that in this weekend. in between 3 soccer games, and a christmas parade.